Ruled by Mercury, the winged-footed messenger of the Gods, gemini’s main purpose is communication. They make good teachers, salesmen, and radio announcers. They are the most versatile sign, social and fun loving with a good sense of humor. 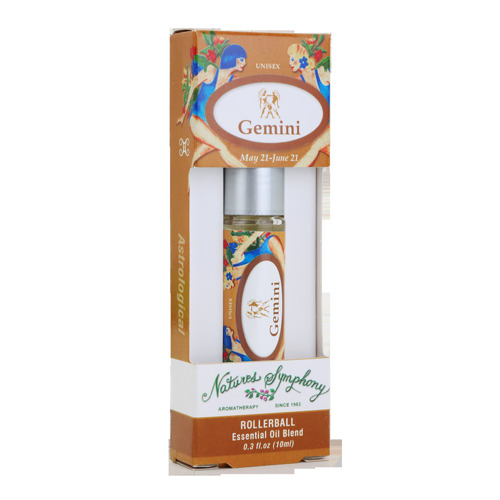 This blend includes oils ruled by the sign and in tune with Geminian nature. Ingredients: Fractionated coconut oil (Cocus nucifera), with Organic/wildcrafted essential oils of lavender (lavandula angustifolia), peppermint (mentha piperita), lemongrass (cymbopogon flexuosus), clary sage (salvia sclarea).